Watches are all about individuality, but for smartwatches and their often limited screen and case variations, it can be difficult to make yours truly unique. Thankfully, since the Apple Watch went on sale in 2015, accessory manufacturers have been busy making a huge range of straps, cases, charging docks and other products to make your Watch stand out from the crowd. Of course, Apple itself helps out by selling a wide range of different straps and offering a number of customisable faces. But you can go further than this. There are many more straps, of course - and for far less money than Apple charges - along with docks, protection, and even a chain to turn your Watch into a pocket watch. Looking for the best Apple Watch bands? Personal preference is going to be your primary concern here, because most Apple Watch accessories are about aesthetics and comfort. You will likely want to pick a strap which stand out from the crowd, but which also complements the case and one or more of the faces on your Watch. The quality of these products is also an important consideration. While you can pick up straps for shockingly low prices, some less reputable sellers illustrate their products by using images identical to those on Apple’s own website. So while you may think you’ve bought a replica Hermes leather strap for a pittance, its quality could be questionable. Not only does this mean sub-standard leather, but if the clasp, lugs or fastening mechanism is dodgy, your Watch could be in danger of falling from your wrist. It is also important to check the size of any strap you buy, firstly to make sure it fits your 38mm or 42mm Watch, but also your wrist. Most of Apple’s straps come in small/medium and medium/large, but other companies can use a different scale. It’s best to read user reviews on Amazon, where any major discrepancies in sizing are sure to be called out. Otherwise, the usual technology accessory rules apply. There are brands here you will recognise - like Belkin and of course Apple itself - so you can be assured of their quality. If charging multiple devices at once isn’t for you, then we present Apple’s own Watch charger. This dock magnetically snaps to the back of your Watch and charges it up while you sleep. Sitting your Watch sideways means it can double up as a bedside clock through the night. Available only in white, this charging dock has Apple’s trademark elegance and simplicity. It also carries the company’s high price, which is considerably more than most other options on the market. We really like this elegant dock from Belkin. It looks great, solid, and the charger comes integrated into the dock, so the one that comes with your Apple Watch can become your 'travel charger'. We're currently using the integrated iPhone and Apple Watch valet charger - which is perfect for charging both devices at once. Just like your iPhone, the glass front and stainless steel body of your Apple Watch can be easily scratched or even cracked if you drop it, or knock it against something. Thankfully, there are a number of case manufacturers out there with a solution. This case by Corki is one of the slimmest on the market, making your watch only fractionally larger than its regular size. It also doesn’t interfere with the touch screen, and can be bought in two sizes and five different colours to make sure it matches your watch. The Corki is compatible with all versions of Apple Watch. This two-in-one charger is a favourite of our for being simple and completely unfussy. Where most try to wow with their design - or their wood, aluminium and marble construction - this just gets the job done. It also takes up as little space as possible on your bedside table, while leaving both displays easy to see at a glance if you wake up in the night. Unlike many alternatives, the cables are completely hidden inside the device, so there’s just one to be plugged into the mains. Perfectly timed for the Summer Holiday season this Apple Watch travel case is perfect if you're jetting off this season. Taking inspiration from a sunglasses case, the leather TimePorter holds your cables, spare straps, and of course, the watch. When you arrive at your destination the case converts into a charging stand. This leather case from Sena is perfect if you're a regular traveller. It can sit and charge on your bedside as a dock, or packed away with space for your watch and charger when you're travelling. It does use your charger though, so that isn't ideal. As good as the Apple Watch is, its battery life means a weekend away from home without the charger is going to be a struggle. Thankfully, this charger with built-in charger offers a useful and compact solution for when you’re away from a mains plug, like on a camping weekend. The battery is in the middle of the device, so you open it up, wrap your existing Watch charging cable around the battery, put the wireless pad in place, close it up and you’re good to go - just place your Watch on the charger to refill the battery. Available in grey or silver to watch your watch, the Nomad should provide four full chargers before its own battery needs a top-up. This clip-on case from Griffin is perfect if you need to temporarilyadd a little protection to your Apple Watch.The Survivor Case protects your watch's casing, as well as the screen without impacting on Force Touch, which is super useful in a number of situations. It clips over the top of your watch, so it's easy to pop on and off. A big chunk of marble for your watch, because we not? We might have just described Apple’s own charging dock as the most stylish and expensive out there, but then we came across the DOCK by Native Union - and specifically, this version made from white marble. You could always buy the regular version in midnight blue for £50, but where’s the fun in that? White marble is where it’s at, and we think this weighted charging stand looks particularly classy when paired with a gold aluminium Watch. As well as holding your watch neatly in place at night, the rotating cylinder it straps to has space for holding your watch’s wireless charger. Add some military grade protection to your Apple Watch, literally, with the Spigen Tough Armour Case.With this, you could take your stylish wearable into a war zone, and needn't worry about denting the precious device. It's also useful if you think the Apple Watch isn't stylish enough and want it a little more G-Shock-y. The Iputy Apple Watch stand is made from bamboo and offers an all-in-one solution for charging you Watch, iPhone and up to three other devices all at once. There is a neat cutout in the wood to slot the Watch’s wireless charger into, then feed the USB cable through a hole and out the back of the stand. You can then either plug your Watch and iPhone into the back of the stand, leaving one USB port free for your headphones, tablet, ebook reader or anything else - or plug them into a nearby wall outlet and have all three USB ports free to use. A large cutout for your phone means it will accept any size handset, and you can leave it in its case too. Why not ditch the strap and have an Apple pocket watch instead? Ever wished your Apple Watch was actually a classic pocket watch? No, us neither, but that doesn’t mean you shouldn’t fully embrace this concept. Just slide off your watch’s straps and place your Watch inside the stainless steel case. That way, your Watch is protected and less likely to be damaged by you absent-mindedly grazing it against a wall, and the battery will last much longer through checking it less often. Win-win? Perhaps. Either way, this is a fun accessory which takes the Apple Watch and does something totally different with it. There are a huge number of third-parties producing straps for the Apple Watch, but the quality varies as much as the prices. We think Meridio represents a good compromise between price and quality, while also offering a wide range of colours and different finishes - including ostrich, alligator and python. Prices range from €74 (with the occasional sale item at €52) and go up to €219 for alligator. What’s great about these is the ability to pick the right lug adapters to match the finish of your watch, so no matter what colour your watch is, the strap will complement it. This dock is a neat way to charge up your iPhone, Apple Watch and AirPod earphones all at once. Thanks to clever cable management, wires are neatly fed into the back of the stand, then into place below your iPhone and AirPods case. Meanwhile, there’s a slot for the Watch’s wireless charging pad too. 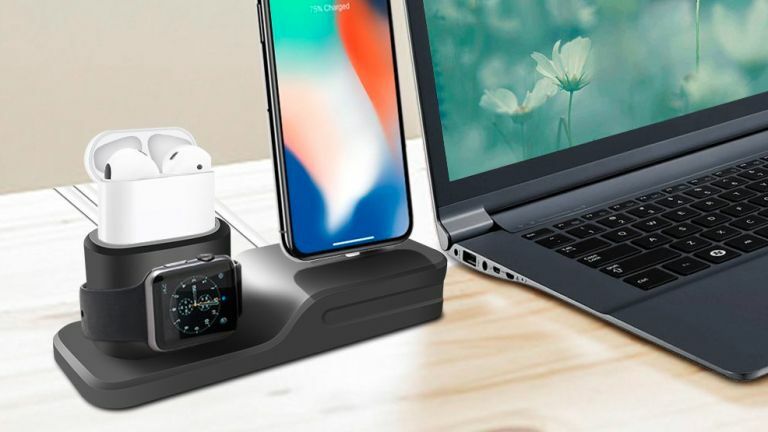 The Kehangda dock shouldn’t take up too much space on your bedside table, and comes with two free gifts - an extra Lightning cable and a rubberised case for your AirPods, err, case. Or how about the best smartwatches?